Without a screenshot from Superliminality, I can only hope that all rooms are ok. 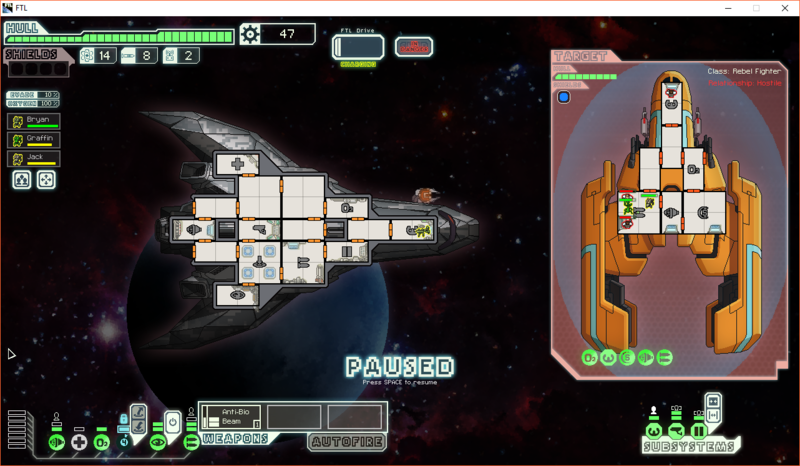 Anyway, you could try another configuration: no weapons, but 3 drones as defense: your only other way to avoid suffering huge damages when you don't have nor shields neither stealth. Has anyone ever considered a Warhammer 40,000 Mod for this game? It would be awesome! dyno101 wrote: Here's your photos! Auron1 wrote: Without a screenshot from Superliminality, I can only hope that all rooms are ok.
Because everyone loves flying the Simo-H.
"Deals moderate crew damage and harms enemy ships." ...Or a fire beam? I suppose that's easier. Well, I'm actually thinking it's a better idea at this point to put more work into a entirely different mod. I may come back to this one when I know how to code as amazing as you do. Believe it or not, an Alienware keyboard, a CM STORM mouse, and a Kotion Each headset does not mean you're any good at any gaming or programming. At all. "There isn't good or bad. There's just insane." dyno101 wrote: "Deals moderate crew damage and harms enemy ships." That could work too. But I'd like a weapon that can damage automated ships so I'm not constantly running or restarting if I run into a string of them during a game. But it does mean when you gain the skills, you've got some good equipment for it. For example, I'm still using the same headset from when I first started Youtube commentary. A person shouting in an echoy room next to mine comes out at barely a whisper. The only difference is now that I put the volume way down low so I can be heard over it all. Also, a lot of my coding work is mostly based off my older stuff (when it comes to events) and just changing a few numbers on a weapon or drone and calling it something different.